Convergences: Poets & Geologists & Driving & Mermaids. John McPhee tells you not to hitch a ride with geologists. 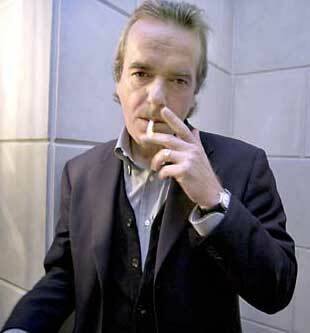 Martin Amis tell you who not to hitch a ride with poets. Montaigne says, Who needs a car when you have a tail? "If I'm going to drive safely, I can't do geology." Poets can create monsters at will; say a fair maid with the tail of a fish, that is, a mermaid. Even when he was in familiar company (his immediate family, for instance) it sometimes seemed to Richard that those gathered in the room were not quite authentic selves -- that they had gone away and then come back not quite right, half remade or reborn by some blasphemous, backhanded, and above all inexpensive process. In a circus, in a funhouse. All flaky and carny. Not quite themselves. Himself very much included. He didn't answer. For a moment Richard looked worryingly short-necked. He was in fact coping with a digestive matter, or at least he was sitting tight until the digestive matter resolved itself one way or the other. Richard had hated all the poets and novelists too, but the playwrights, the playwrights... With Nabokov, and others, Richard regarded the drama as a primitive and long-exhausted form. The drama boasted Shakespeare (which was an excellent cosmic joke), and Chekhov, and a couple of sepulchral Scandinavians. Then where were you? Thanks to M.R. Miller for providing both the London Fields source and the quote itself. So I knew there was some Nabokovilia in Martin Amis's London Fields and The Information , but it wasn't till I visited the former and revisited the latter that I found even more. Vladimir Nabokov, encouragingly, was a champion insomniac. He believed that this was the best way to divide people: those who slept and those who didn't. The great line in Transparent Things , on of the saddest novels in English: "Night is always a giant but this one was specially terrible." Fee fie fo fum, goes the giant. How did VN ever slay the thing? I wander. I write. I wring my hands. Insomnia has something to be said for it, in my case. It beats dreaming. To paraphrase a critic who also knew about beetles and what they liked, Kafka's beetle took a beetle pleasure, a beetle solace, in all the darkness and the dust and the discards. Amis, in The War Against Cliche , his collection of book reviews, loves to use the same sort of Transparent-Things -insomniacs-or-not-"There's only two kinds of people in this world" line as an opening hook (not often, but often enough: some examples: "It was in Joysprick (1973), I think, that Anthony Burgess first made his grand-sounding distinction between the 'A' novelist and the 'B' novelist" (113), "There are two kinds of long novel" (121), "Dipsomaniacs are either born that way, or they just end up that way" (207)). There's Nabokov in Kingsley too! I'll be checking out the letters and Stanley and the Women presently.